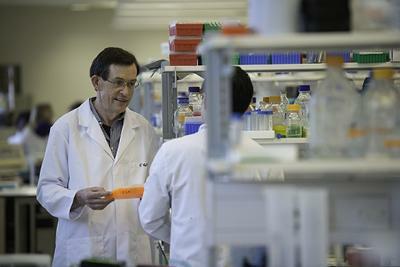 A University of Southampton Professor, in collaboration with colleagues at the BC Cancer Agency Research Centre, have discovered a novel way of killing cancer cells. The research, recently published in the journal Cell, has found a new potential treatment for cancer, which leaves the body's healthy cells undamaged, unlike traditional therapies such as radiotherapy. Almost all cells in the human body contain the same basic components, meaning that to attack one of them in a cancer cell, that component will also be affected in normal cells. This study has identified a specific protein that is not necessary in normal cells but seems to be important to the survival of cancerous cells. A treatment that could block this protein could represent a significant breakthrough in the future of cancer treatment. Traditional chemotherapy and radiotherapy cause damage to healthy cells, and other more targeted treatments are usually only effective for individual types of cancer. Contrastingly, this new development does not damage healthy cells and could also be used to treat a wide variety of different cancers. Professor Proud and the team are now working with other labs, including pharmaceutical companies, to develop and test drugs that block eEF2K, which could potentially be used to treat cancer in the future.